...that Mara Sov was the first Awoken and the first to be sent to the Distributary? Kagathos, Empathic Mind is an Ultra Mind found at the end of the quest, My Captain. It was one of the Vex that the Exodus Black Captain talked to before death, and was killed by The Young Wolf. Kagathos will spawn in an arena-like area after scanning all of the Confluxes. Multiple adds will also spawn at the same time to overwhelm the player. Kagathos will continuously move around the arena, damaging the player with Void blasts. 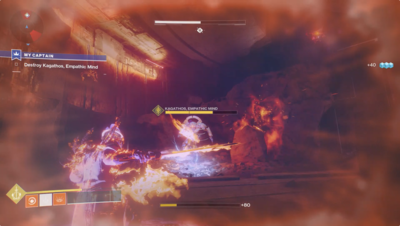 The Vex Mind is the final encounter of the quest. Kagathos' possible purpose is to translate, but this is unproven as it tried to kill the Guardian instead of helping them and didn't use its empathic ability.